The Ellen Report ...: A pair for a pair. A pair for a pair. It took me a while to finish these sock. I had a few setbacks and I won't lie, the extra weaving in for contrast heels and toes was not fun, but I do love to whine about weaving in. 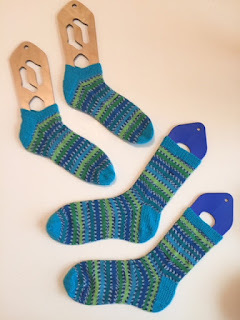 I worried I would have to play yarn chicken to squeeze out the second pair, but once I was half way through the foot on the second sock I relaxed a bit. When these dry out, I'll need to stick them in the mail. I knit these for a friend and her daughter. They can share or decide who gets which pair. I hope they bring some warmth and happiness. I think ankle socks are great warm weather knitting projects. I haven't been knitting as much as I'd like, but that's how it goes. There is so much to do this evening, but I'm secretly hoping to cast on something else tonight. Fingers crossed, knitters. Pretty, pretty! They make a lovely gift for your friends. Thanks Dee! I hope they fit! That's a pretty little sock family you have there! Thank you Araignee, I won't lie, I like the matchy matchy aspect. I may have a serious West Yorkshire Spinners problem. They keep expanding their sock yarn collection ... yikes! Oooh, the socks are lovely! What a treat for your friend and her daughter to receive hand-knit socks. I never weave in ends on the toes. I save it for when the inevitable holes appear! Hahaha. I love this post. Yes for squeezing in that knit time! I let the start and end of a sock be sometimes. IF they are just for me!! I'm super squeezing Kathy! My husband was like, um how late did you stay up last night? My response? These are great Ellen! I am sure they will be well loved. 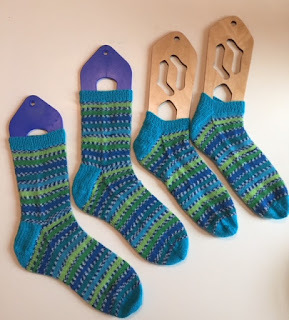 I made a pair with the same yarn a couple of years ago. Fun colors! great socks my friend, and I love ankle socks because that is all you can wear here in Florida. Thank you Mere, I have definitely tapped into a new affection for ankle socks. I'm sort of surprised because I wear them consistently for exercise and sneakers, but I associate hand knit socks with luxury lounging LOL. I am so impressed by your stripes! They match up so perfectly. What a lovely gift for some friends. I hope you did get to cast on for your next project! Thank you! Honestly the stripe matching was a bit of a "well that worked out" I don't remember trying too hard at the joins. Anyways, I didn't cast on something new, because I found something old and unfinished. C'est la vie! beautiful socks :) Now to get the weather to WEAR them- it's chilly today so I'm quite happy. Great gift. The colorway is bright and cheery. I'd like to have a collection of shorties. That was my intention this year but I forgot since there are sock patterns I want to knit. I am definitely on board with the shorties. Ugh, there is so much to knit!! so much! !